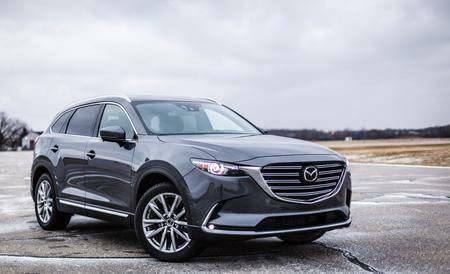 Island Mazda near Freehold, New Jersey proudly represents the 2017 Mazda CX-9. In the CX-9’s athletic stance, elongated hood and tapered roofline, the overall effect is a combination of composed power and instantaneous movement, resulting in a truly striking three-row SUV to thoughtfully designed to celebrate driving. Like every aspect of the CX-9, its signature paint color was crafted with the utmost attention to detail. Over the sheet metal, a black primer coat is covered with a precisely sprayed layer of aluminum silver paint. The highly controlled process ensures the coat’s aluminum paint flakes are aligned with the CX-9’s body panels. Along with gray and colorless clear coating, this gives the black and silver hues more luminosity and a reflective, liquid-like quality for our most premium color yet. The 2017 Mazda’s advanced technology makes driving more enjoyable. The CX-9’s SKYACTIVE 2.5-liter engine features an innovative dynamic pressure turbocharger that gives you power as soon as you hit the gas, nearly eliminating “turbo lag.” Because weather and road conditions can change in an instant, Mazda’s available smart predictive i-ACTIV all-wheel-drive system is on alert, monitoring conditions and ready to adjust power delivery to help give you optimal traction before your wheels can slip. By monitoring everything from outside temperature to throttle input and braking patterns, the i-ACTIVE AWD predicts when an all-wheel drive might be needed. Then, it preemptively optimizes torque distribution to help curb traction loss. The CX-9 is technology that inspires confidence. Technologies like milliwave radars and cameras will give you sixth sense safety, helping to alert you to hazards before they happen. Available Lane-keep Assist adds to the warnings of the Lane Departure Warning System. It senses a potential unintentional lane departure at speeds above 37 mph or higher, it will perform minor steering corrections to help guide your vehicle back to the center of the lane. Don’t wait any longer to satisfy your driving needs and stop by Island Mazda near Freehold, New Jersey today and check out the all-new 2017 Mazda CX-9!